At your selected departure time, meet your guide at Harry’s Saloon near the Federal Triangle Metro Station. 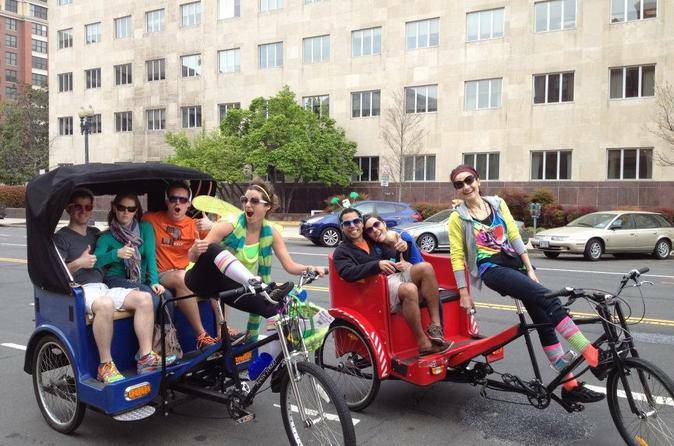 Hop aboard a pedicab with your small group and sit back, relax and enjoy the views as your guide takes you through Washington DC on a 40-minute sightseeing tour.First, check out the Old Post Office Pavilion, the National Archives Building and the Hirshhorn Museum and Sculpture Garden. Then continue to the National Mall, one of DC’s most famous sites. Here you’ll get up-close views of the Washington Monument, the Lincoln Memorial and the United States Capitol Building. Hop out at the Capitol to take some photos and stroll by the reflecting pool. Next up is bustling Chinatown, followed by a ride past the Smithsonian's National Air and Space Museum, which houses the biggest collection of historic aircrafts and spacecrafts in the world.Throughout your ride, your friendly, knowledgeable guide will offer detailed commentary about the sights you see. Be sure to pay attention, as you’ll be asked some trivia questions for a chance to win a lovely souvenir! Your tour concludes at the merry-go-round in front of the Smithsonian Castle Information Center.